PARIS (May 21, 2013) — Fiona Sze-Lorrain has published a new book of poetry. My Funeral Gondola was released on May 20, 2013 as a Mãnoa Books title from El León Literary Arts. “I was also working on different possibilities of silence and images in terms of lyricism or poetic accidents,” says Sze-Lorrain. The book cover image is Nuages in (détail), a painting by Claude Monet from the Musée de l’Orangerie in Paris. It is evocative of the impressionistic feel in Sze-Lorrain’s poetry. My Funeral Gondola is the second book of poetry from Fiona Sze-Lorrain. Her debut collection of poetry, Water the Moon, was published in 2010. In addition to her own writing Sze-Lorrain translates poetry and non-fiction in English, French and Chinese. Her translation includes several contemporary French and American authors, and contemporary Chinese poets from Zephyr Press. She co-edited the Mãnoa anthologies, Sky Lanterns (2012) and On Freedom (2013), both from the University of Hawai’i Press. She is currently the editor at Cerise Press and Vif Éditions. 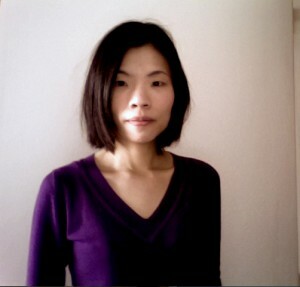 Sze-Lorrain received her university education as a scholar at Columbia University, New York University and Paris IV-Sorbonne, where she obtained a PhD in French. She lives in France. Sze-Lorrain is also a zheng harpist who has performed worldwide. She studied mainly with world renowned zheng master Wang Changyuan. She continues to give concerts worldwide. In recent years, she has been working with several European musicians, exploring jazz and avant-garde compositions on the ancient Chinese harp. In 2004, Sheng Productions (The Chinese New Yorker) featured a 30-minute documentary that showcases her artistic career. Find My Funeral Gondola at spdbooks.org, amazon.com and www.fionasze.com. The sickle moon looks down.